The Baltans are invading Palookaville! And Ultraman is nowhere to be found! The Flaming Carrot shall protect you all! I'm a huge Daikaiju fan!!! Cool! There's lotsa cool kaiju models out there. But, Ultraman is still busy, so here's my first character morph, which coincidentally happens to be of Ultraman! There was a whole spanking series. I'll dig it out! Meanwhile, Redking found a new friend! lovey bear is also snack size. oh noess. We want Space Giants and Spectreman and Johnny Sokko's Flying Robot!! This Thread has lain dormant too long! 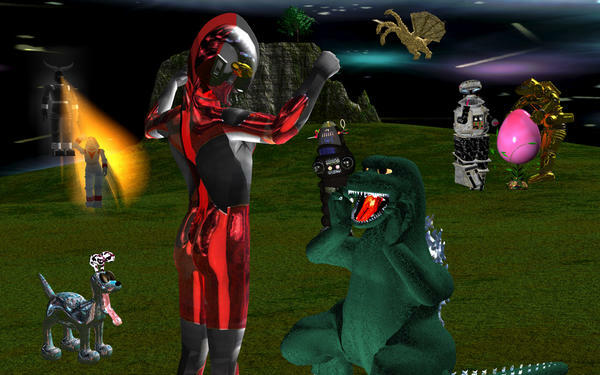 Ultraman has been showing off his splendid physique for a very appreciative Godzilla! I mean, we knew he was busy, but who would have thought?? See what these guys get up to when left alone for too long? Where are the rest of the Kaiju Renders?